Paul Knoke began his work with historic musical instruments while a student at Brighton High School. He spent two years working with the collection of instruments at the Rochester Museum and Science Center as an Independent Studies course. His Junior year whilst earning a degree in history at the University of Rochester included a semester abroad as an intern with the musical instrument collection at the Victoria and Albert Museum in London. While there, he organized and catalogued the museum’s files of reference photographs of instruments, and designed and implemented new display techniques for the instrument gallery. In addition to piano, organ, and harpsichord, Paul studied harp with Marie Goossens and Nan Gullo. He has been the principal harpist of the Brighton Symphony Orchestra since 1990. 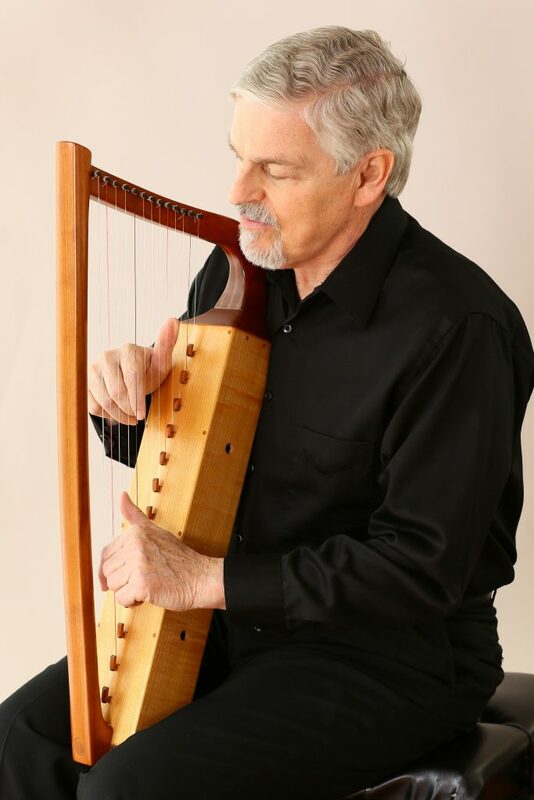 Mr. Knoke is a charter member and past president of the Historical Harp Society, and has lectured and performed at several of their conferences. In 2007 he was invited to act as guest curator for the Mildred Dilling Harp Collection, now on permanent display at Indiana University. In 2012 he performed in concert at the Metropolitan Museum of Art and at the 40th Conference of the American Harp Society on an 18th century harp from his collection. Nancy Hurrell is a harp historian, author and consultant to the Museum of Fine Arts, Boston. 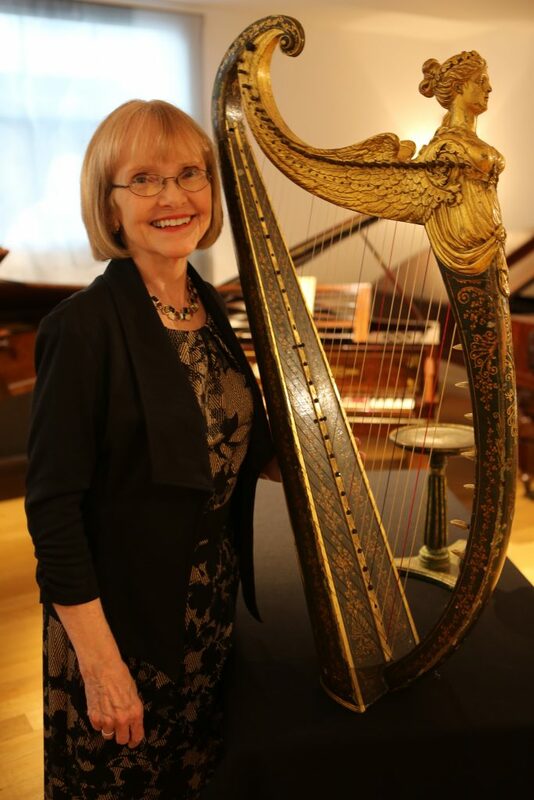 The leading authority on John Egan, Hurrell spent a decade examining and cataloguing Egan harps in museums in the US, Ireland and the UK for her book, The Egan Irish Harps: Tradition, patrons and players published by Four Courts Press, Dublin (2019). She has several journal articles and authored entries in the Grove Dictionary of Musical Instruments (2014), and her lectures include the Royal Irish Academy (Dublin), Royal Academy of Music Museum (London) and the Metropolitan Museum (NY). 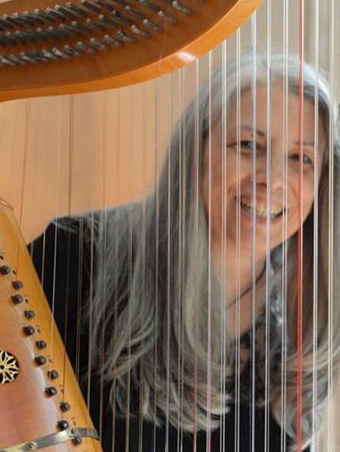 Hurrell performs and records with several Boston early music ensembles and has published arrangements in her Historical Harp Collection series. She has a master degree in harp performance and studied abroad with the harpist of the BBC Welsh Symphony. Hurrell has been an instructor at the Boston Conservatory and currently teaches early harp at Brandeis University. Her groundbreaking CD, The Egan Irish Harp, is the first recording of an Egan Portable Irish Harp, c.1820. Ron Cook has performed on medieval and Renaissance harps for forty years. He has performed at many locations around the United States, including at the Boston Early Music Festival, the Berkeley Early Music Festival, the Amherst Early Music Festival, the International Congress on Medieval Studies at Western Michigan University, and the Annual Conference of the American Harp Society. He has given presentations on historical harps and related topics or had residencies at New York University, The Ohio State University, Capital University and Bradley University. He was also a founding member and, for thirty-eight years, the director of The Early Interval, an early music ensemble based in Columbus, Ohio. Mr. Cook is the author of English verse versions of eight of the lais of Marie de France, which he has performed with the harp at locations around the United States, including fifteen presentations and performances sponsored by the International Marie de France Society at the annual International Conference on Medieval Studies and at two congresses of the International Courtly Literature Society in Canada and the United States. In addition to serving as an officer or trustee of many local arts organizations, Mr. Cook is a past treasurer of The American Recorder Society, a founding trustee and past president of The Historical Harp Society, and a past president of Early Music America. He has taught and performed at, and sometimes served as program director of, many workshops and conferences presented by the Historical Harp Society. Mr. Cook is the author of three articles pertaining to Arabic and Andalusian music published in the past few years in the Historical Harp Society Bulletin. A total of eighteen of his articles on historical harps have been published by the Historical Harp Society, and two of his articles relating to Marie de France have been published in Le Cygne, the journal of the International Marie de France Society. In 2013 Mr. Cook published a book entitled The Early Medieval Harp: A Practical Guide, a chapter of which was reprinted in The American Harp Journal in its Winter, 2013 issue. In 2016 he was the recipient of the Early Music America Laurette Goldberg Award for lifetime achievement in early music outreach. Sarah Deere-Jones is a graduate, prize-winner and Associate of the Royal Academy of Music. 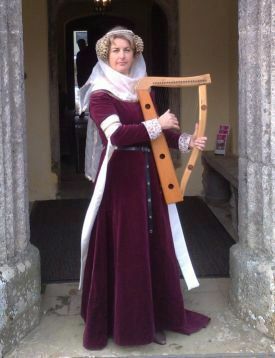 Alongside her career in performing and composing for the harp, her life-long passion for history lead her to research the history of the harp in England which has revealed a hidden dimension to the instrument’s past. She has now collected nearly 300 images from iconography and studying them has been able to track the development and use of the instrument in England through the centuries. As well as recording her own compositions for lever harp and wind-blown ‘Aeolian’ harp, she has written choral works and published many books of harp music now used in grade exams, and has also restored and commissioned replicas of rare 19th century harps, as well as researching the authentic performance-technique of the rare and uniquely English Regency instrument the ‘Harp-Lute’. Christa Patton is an early harp specialist with a particular focus on the repertoire of the early 17th century. She studied the Italian Baroque harp at the Civica Scuola di Musica in Milan, Italy with historical harp specialist, Mara Galassi. A specialist in early opera Christa has performed in productions of Monteverdi’s Il Ritorno d’Ulisse in Patria, L’Incoronatione di Poppea, and L’Orfeo with the New York City Opera, Opera Vivente, Wolf Trap Opera, Tafelmusik, and Opera Atelier. She has also performed in Luigi Rossi’s Orfeo with the Toronto Consort, and Francesco Cavalli’s Il Giasone, with Opera Omnia. In addition, Christa has appeared as a guest with Apollo’s Fire, King’s Noyse, Toronto Consort, Seattle Baroque Orchestra, La Nef, Blue Heron, Folger Consort, Parthenia, ARTEK, Pegasus, New York State Baroque Orchestra among many others. Christa received her Doctorate of Musical Arts and Master of Music degrees from Stony Brook University, and her Bachelor of Music from the Eastman School of Music. She is presently an Adjunct Lecturer at the Graduate Center at the City University of New York and a Visiting Scholar at Rutgers University in New Brunswick where she lectures and directs early music ensembles and opera projects in seventeenth century repertoire. As Musical Director and Co-Director of the Baroque Opera Workshop at Queens College, Christa leads a specialized course utilizing period sources to realize works of early seventeenth century composers in performance. Since the workshop’s beginning in 2010, she has collaborated with vocalists Julianne Baird, Ellen Hargis, countertenor and stage director, Drew, Minter, and Commedia dell’Arte master, Antonio Fava to create artful performances based in sources of the 16th and 17th centuries. Also a multi-instrumentalist, Christa has toured the Americas, Europe and Japan with Piffaro the Renaissance Band, Early Music New York directed by Fredrick Renz, Lipsodes, and Ex Umbris. Her recordings include “Istampitta” on the Lyrachord label, “Chacona” also on the Dorian label, “Trionfo d’Amore e della Morte” on the Dorian label, “Los Ministriles in the New World”on Navona Records, Nobile Donna on ATMA among others. Soon to be released will be a recording with Julianne Baird of mid-seventeenth century music composed by the Roman castrato, Marc’Antonio Pasqualini and will include many works by him not yet published or recorded.